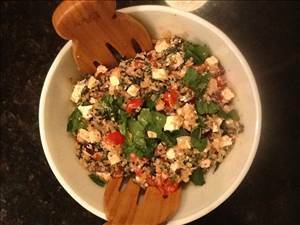 Sensational quinoa with spinach, red onion, kalamata olives, fat free feta, roasted tomatoes and tofu. Add 1 cup of dry quinoa with 2 cups of water in a sauce pan. Bring to a boil, and reduce to a simmer for 15 minutes. While quinoa is cooking, finely chop garlic. Add garlic and olive oil and black pepper with grape tomatoes in a small bowl. Add to baking sheet and broil for 10 minutes until tomatoes cook down. 78 members have added this recipe to their cookbook. Are some of the directions missing? They don't use all the ingredients. Not sure what to do with the tofu. This is perfect for my on the go work schedule. Im a train engineer and have to pack all my lunches, breakfasts and dinners for up to 24 to 36 hrs. its a great cooler dish! This salad can be a side at lunch and dinner. Thanks. A healthy vegetable salad with a sweet dressing. Crunchy and fresh, this salad of sprouts and walnuts is a delicious twist on the more traditional recipe. A tasty bean salad that's great for a barbecue. There are 257 calories in 1 serving of Quinoa Mediterranean Salad. Calorie break-down: 49% fat, 29% carbs, 21% protein.